Indian Dhurrie Rugs – Dhurries are flat-woven rugs, similar in texture to kilims, that originated in India and its surrounding areas. They are an ancient form of art, having first been woven thousands of years ago. Originally the dhurrie was created primarily for practical reasons. Traditionally it was used not only as a decorative floor covering area rugs but also as bedding, packaging and (in some regions) as a form of dowry. The use of dhurries was not dependent on class, and they could be found both in the royal palaces and in the homes of commoners. Earlier forms of dhurries were often very simple in design, since the aesthetic appeal of these woven items were not seen to be as important as their function. It was only around the mid-1900’s that the dhurrie saw a boom in popularity outside of India and began to be desired internationally as a decorative piece. In terms of design, dhurries vary enormously. They can be coarse or finely woven, plain or immensely detailed. However, in traditional dhurries there are a few trends that can be observed. 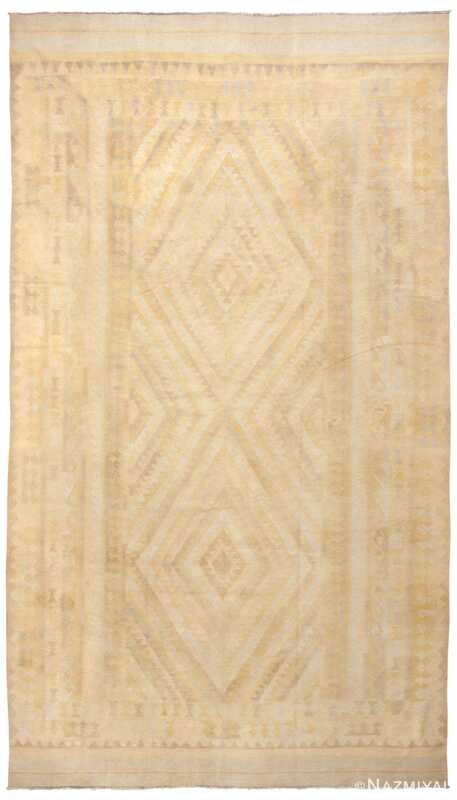 For example, the design of a dhurrie is often heavily influenced by the region from which its weaver is from. In particular, many traditional dhurries woven in an area with a strong Islamic influence will make use of motifs common in Islamic art. Dhurrie weavers from Darjeeling often borrow design elements from their neighbors in Tibet, while dhurrie weavers from the south tend to incorporate the bold colors popular in their region into their designs. In terms of color, indigo and white were very popular in older dhurries regardless of region. Indigo dye was a precious commodity at the time and white complemented the color nicely, helping it stand out. This antique Indian Dhurrie features a double medallion decorated with traditional geometric patterns rendered in a dreamy combination of chic pastels.